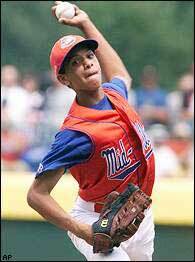 So this is sad: Danny Almonte, the onetime Little League World Series legend who turned out to be older than everyone had sad — and ended up marrying a woman 11 years his senior — is gonna need himself a new career. In a really bad sign for his future major league career, Almonte was cut by the Southern Illinois Miners over the weekend. The Miners, which are based in Marion (a town two hours south of Mattoon, where Pete Rose spent his prison time), are members of the Frontier League, which, while fun, is pretty damned far from the Major Leagues. And Almonte couldn't even catch on there. Almonte had a 5.28 ERA in six appearances. He will now have to go back to his old job, a catch-all position that involved fixing typewriters, installing Beta Max machines and volunteering for Barry Goldwater.